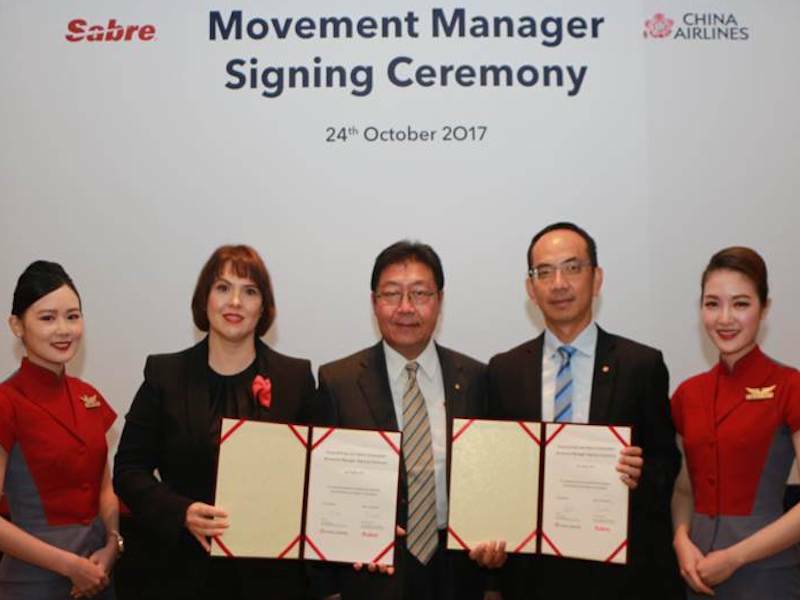 Sabre Corporation, the leading technology provider to the global travel industry, today announced a partnership with China Airlines that will modernize and transform the airlines’ operational systems and processes. Announced at the Association of Asia Pacific Airlines’ (AAPA) 61st Assembly of Presidents in an official signing ceremony, the partnership will provide China Airlines with Sabre AirCentre Movement Manager solution, which provides operations controllers with the capability of monitoring status of flights, making the overall network more efficient. “We are excited to expand Sabre’s well-established relationship with China Airlines as their chosen technology partner for this solution. As the flag carrier of Taiwan, China Airlines plays a crucial role in supporting the fast-growing global travel industry in the region as inbound and outbound travel to Taiwan continues to grow,” said Dasha Kuksenko, vice president & regional general manager, Sabre Airlines Solutions, Asia Pacific. “With our Movement Management solution, China Airlines will continue its industry-leading performance by improving on-time performance through a more comprehensive overview of their flight movements. This will also reduce operating costs and improve the traveller experience by reducing operational-related delays and cancellations,” she added. China Airlines has a long standing strategic partnership with Sabre, utilizing other Sabre solutions such as crew management, schedule management and network planning across the carrier’s entire operations. The addition of Sabre AirCentre Movement Manager will increase on-time performance by communicating movement or irregular operations information simultaneously to other flight operations personnel, eliminating the need for duplicate data entry and makes problem resolution more efficient. By reducing operational-related delays and cancellations, airlines will improve their travellers’ experience too. “Sabre is able to provide an end-to-end solution that allows us to drive customer centricity to generate new revenues,” said Steve Chang, Senior Vice President of China Airlines. Atlas Lu, Vice President, Information Management Division of China Airlines added, “As we continue to provide our customers with the best travelling experience, we constantly look at improving what we offer to them, while ensuring that there is minimal disruption in the delivery of our service too. With this new solution, we have access to real-time flight information and can quickly make adjustments to any irregular flight operations,” he added.